Learn to play piano anywhere! Piano Apprentice is the ultimate piano teaching tool for iPad, iPod and iPhone. 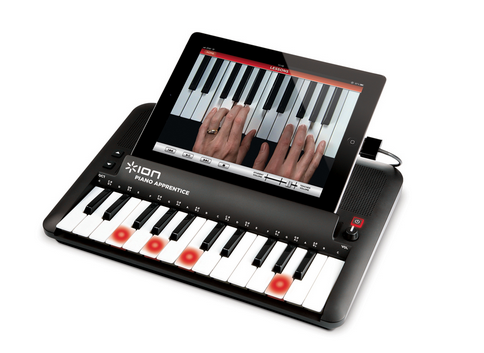 Simply connect your iPad, iPod or iPhone, download the free Piano Apprentice app, and start playing piano instantly! Piano Apprentice is a lightweight, highly portable 25-key keyboard with built-in stereo speakers that deliver authentic piano sound and keys that respond to your touch. It’s easy to follow along as acclaimed piano instructor Scott Houston, aka the Piano Guy, appears on the screen demonstrating how to play while the actual keys on Piano Apprentice light up, showing you where to place your hands. The Piano Apprentice app will even teach you how to read real music notation! Bring out your inner musician with Piano Apprentice today!